One of the joys and goals of our ministry is to have our involved students share their testimonies with their peers. It is a great step of faith for them and they grow in their walk with God as they see Him use their stories to touch hearts. Students are also inclined to listen to their peers, so it is a “win” for everyone. Thank you, thank you for partnering with us to give these students opportunities to see God at work! On Wednesdays I’ve been meeting with a group of freshmen at Talawanda High. Most of these guys played football this fall and are now coming to a weekly Bible Study / Follow-up Group. Last week I took the freshmen guys to a cemetery. We found the youngest person to die (2 months old) and oldest (102 years) and then I asked the guys how long they expect to live. Alex said 50 years; Drew said at least 100. We talked about how our lives are a mist that appears for a while then vanishes. I challenged the guys to make their days on earth count by investing their time in things that are going to last for eternity. 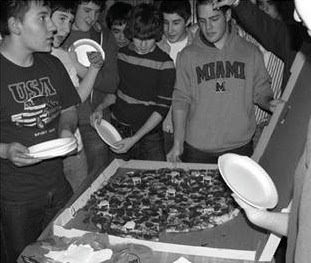 Later, some of the freshmen students involved in SV hosted a Pizza Party Outreach (with a 29 inch pizza!) for the Freshmen Basketball team. Eleven of the 13 guys on the team came and had a blast as they played “knockout”, answered trivia questions for prizes, and ate a huge pizza. Sam & Alex told the guys why they like Student Venture, and Drew explained how to begin a relationship with God. Two of the basketball players, Sam H and Trevor, indicated on their comment cards that they asked Jesus to come into their lives after Drew shared the gospel. Pretty cool! Pray for Sam H. & Trevor as well as the other freshmen. We’ll be getting together every Wednesday after school.